These new tractor models have state-of-the-art features and increased levels of power, making them perfect across different agricultural phases. John Deere has announced the addition of two more 6R tractor models: the 6230R and 6250R. For more information, contact your local John Deere dealer or visit JohnDeere.com. On February 13th-16th, John Deere will attend The National Farm Machinery Show. Join us in the South Wing at the Kentucky Exposition Center in Louisville, Kentucky. John Deere is amongst more than 600 exhibitors taking part in this year's Farm Progress show, expected to continue through August 30 in Boone, Iowa. On Saturday, September 8th, tractor enthusiasts will be gathering to participate in the 7th annual John Deere Heritage Tractor Parade. John Deere has announced that it's adding new attachments and implements to its lineup of Frontier equipment as a means of helping large property owners with land maintenance. 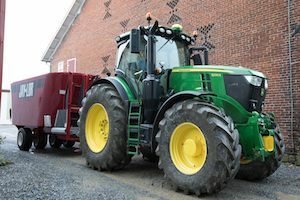 John Deere has announced that it is adding several implements to its lineup of Frontier equipment in an effort to cater to large property owners. Neil Behnke, a volunteer with the nonprofit organization Black Forest Together, was named winner of the second annual "Small Machines. Big Impact." contest. On August 4th and 5th, John Deere's historic site in Grand Detour, IL will be celebrating the history and trade of blacksmiths with its “Hammer In 2018" event. The John Deere Power Products facility in Greenville, Tennessee is celebrating its 30th anniversary this summer with a social gathering on August 3. Children of all ages will be welcome to enjoy a Learn and Play Day on Saturday, July 21 at the John Deere Pavilion in Illinois. John Deere has been included amongst the best of Illinois on the "Top 200" list commemorating the state's 200th birthday. John Deere has announced several new updates to its model year 2019 lineup of 9R, 9RT, and 9RX Tractors. Guests are welcomed to enjoy a season of special events at the John Deere Historic Site starting on Sunday, June 24. To learn more about these events or this venue, visit www.VisitJohnDeere.com. John Deere has announced that it will be participating in the 2018 Commodity Classic between February 26 and March 1, to be hosted in Anaheim, California. John Deere is now introducing the new 5090EL and 5125ML tractors, expanding its lineup of specialty tractors. John Deere announced that its 9RX Series Tractors have been awarded the Good Design™ Award for 2017. EquipmentWatch, a heavy equipment data and software company, announced its nominees for the Highest Retained Value Awards, and John Deere leads the pack with 26 nods. John Deere has a new line of roll-out bucket offerings featuring the RB72, RB84 and RB96. These models are designed to best match the attachment to the machine. The “Gathering of the Green” will be held between March 21 and 24 in Davenport, Iowa, and registration is now open for the event. John Deere has announced its latest advanced guidance and machine data sharing technology with the addition of three new AutoTrac™ applications.